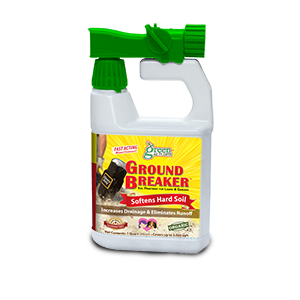 Ground Breaker is a fast acting soil penetrant that softens hard soil, increases drainage & eliminates runoff OVERNIGHT!. Ground Breaker targets and treats hard & compacted soil and is especially good at treating areas where puddles form, runoff occurs and heavy compaction exists in all soil including heavy clay, silt, sand and caliche. Hard soil makes life tough. Its hard to dig in and its hard for roots to grow in. 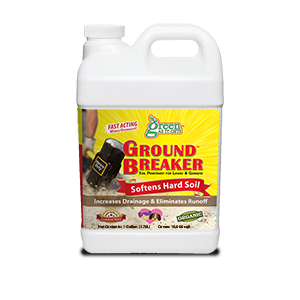 Ground Breaker is a heavy duty soil penetrant that opens up the pores of the soil making it softer, easier to dig, and easier for plants to grow. This unique dual-acting formula treats both types of compaction and does NOT contain alcohol. Other products only treat one type of compaction and contain alcohol (which kills soil life). Excess salts will also be carried away from the root zone as the water continues to percolate downward. Contains organic yucca and organic kelp extract. 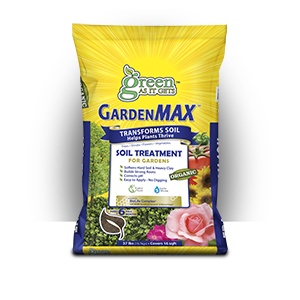 Ground Breaker Quart RTS GardenMax 37lb.